Thrill-seekers looking to take their fear of heights to a new level can come to downtown Los Angeles this summer. There, they can careen down a clear glass slide. It will be atop the tallest building west of the Mississippi. The "Skyslide" is scheduled to begin sending adventurers down a relatively brief ride. 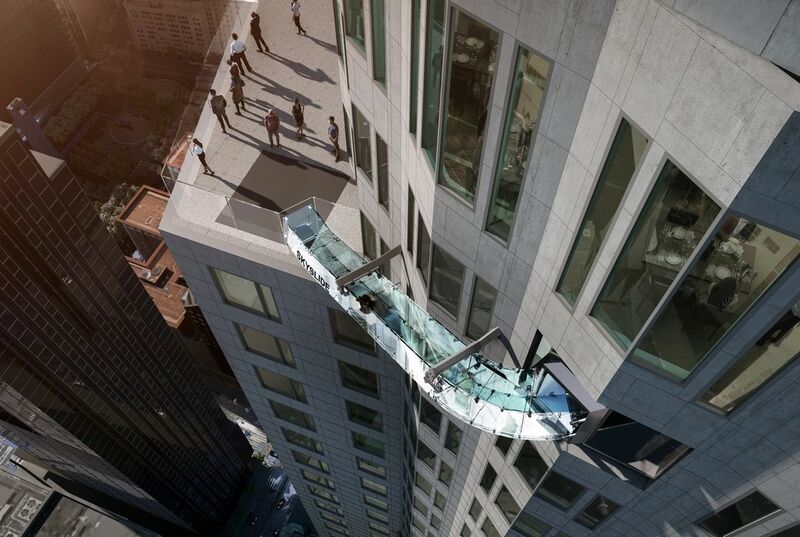 It will run 1,000 feet above the ground in June. The ride will span 45 feet. It will be between the 70th and 69th floor of the U.S. Bank Tower. Nothing but inch-and-a-quarter glass will separate riders from the ground. The ride promises to provide both a thrill and quite the view. That is, if riders are willing to open their eyes. On a clear day, the 72-story tower provides panoramic views. They can extend to Catalina Island. It is 22 miles off the Pacific Coast. And over the Santa Monica Mountains to the city's sprawling San Fernando Valley. "There will be nothing like it in the U.S.," said Lucy Rumantir. She is head of U.S. operations for the building owner. It is OUE Limited of Singapore. "When you do something new in LA, you've got to be creative," she said. She added that there are already plenty of things to see in the area. But the building owners' think a wild slide through the sky might drive more thrill-seekers downtown rather than to other traditional attractions. Downtown nightlife has exploded in recent years. There's been the addition of upscale hotels, The Broad museum, the LA Live entertainment district and trendy bars and restaurants. 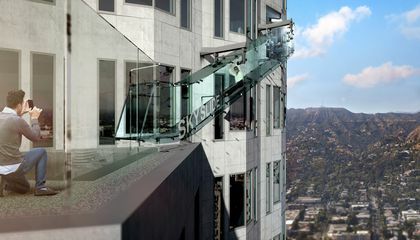 Skyslide also continues a trend of creating attractions designed for urban thrill-seekers. For some reason, they seem eager to laugh in the face of acrophobia. That is the name for a fear of heights. Grand Canyon Skywalk is the horseshoe-shaped bridge that opened nine years ago. It allows visitors to stroll right off the edge of the canyon's north rim. They can stare through 2,000 feet of nothingness to the canyon floor. The Las Vegas Strip's X-Scream roller-coaster sends riders on a wild plunge. It goes off the top of the 1,100-foot Stratosphere Hotel and Casino. Chicago's Willis Tower (formerly the Sears Tower) renovated its 103rd floor observation deck in 2009. It added all-glass balconies. Those allow people to actually step several feet off the ledge. The ride will be "relatively brief" because they will have only 45 feet to see the panoramic view of downtown L.A.
To be honest I think this is bad idea because if someone would to slip that could cost a life. It might seem like an awesome and cool idea but the more you think about more dangerous it becomes. I think if we do use this idea it should be a lot safer. The ride is relatively brief because if a person come to the skyline it would go fast. And more people won't get bored waiting and watching . And they would want to slide again and pay more money.l would ride it if I can. Because it looks fun and interesting. It will because its glass and people normaly go fast on glass. It will be brief because it isn't steep and they will take down a careen down the slide. It is far up so the ride down will be FASTER. The ride will be a "relatively brief" because it's high of the ground and it will probably go fast. The ride will be brief because the ride is very steep and it will go by very quick. It is also on glass and glass is usually faster then what normal slides are made of. This article interested me because I like water slides but haven't been on one since I was just a little boy enjoying life cruising around town with the boys. I would never go on this. if you were to like fall and the glass were to break that would not be good. this is pretty cool.